A Wayne Rooney-inspired Manchester United beat Belgium’s Club Brugge 4-0 in what could be a turning point for the England captain as he ended his goal drought. It was a match that was controlled by United throughout with Brugge doing little to keep their chances alive. United started the game with one change to their line-up that had played the first leg, with Morgan Schneiderlin dropping to the bench and Ander Herrera getting the nod. It could be called Rooney’s game as he looked dangerous, linking up well with Memphis Depay and Juan Mata. But Adnan Januzaj had an off night. Javier Hernandez failed to convert a penalty chance and did not look convincing in the box. We analyze and rate Manchester United players' individual performances. The Argentine goalkeeper was tested very few times during the game, but he was seen making the same mistakes as he made in the first leg. He was unable to pass to ball to his intended target on multiple occasions which could have cost United. But Club Brugge could not make the most of their opportunities and never came close to troubling Romero in goal save for one big chance when Romero’s smart reflexes whipped the ball off Diaby’s feet to maintain United’s first half lead. Even though the Argentina international kept a clean sheet in the game, he was far from convincing. Romero cannot play with the ball at his feet and it was evident. Van Gaal should be worried about his passing skills as it can cost United in the big games. Another solid performance from the new right-back away from home. He had his positioning spot on while defending, tracking his runners and keeping a check on any passes beyond him. He was impressive while on the attack as he linked up with Juan Mata on United’s right. His interceptions and speed make him one of the best players on the pitch for the Red Devils. He was well matched by fellow teammates Daley Blind and Chris Smalling. The United defence did so well that whatever little attacking threat Brugge mounted, the defenders had all the answers. He was again the best defensive performer of the game. 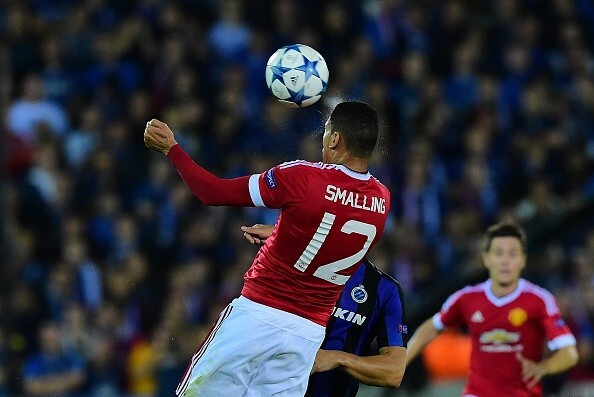 Several of Brugge’s attacks were met by Chris Smalling who dealt effectively with everything they had to throw at him. He made almost no errors in the game and showed why he has been United’s player of the match in their four games so far. At times, he showed great anticipation stepping out of the backline when needed to intercept or make a foray forward. He also tried making the runs into the midfield to assist the forward line. As composed as he is on the ball he looked nervy when his opponents attacked him. He nearly let Brugge back into the tie with a careless header in the first half and was lucky his opponents merely focused on stopping the rout in the second period. The Dutch player has grown into his new role. He did not do much out of the ordinary but went about his business with sufficient grace while also covering for Luke Shaw a number of times while the Englishman forayed forward leaving spaces behind him.Blind has also shown he can play well in the central defensive role but struggles with aerial duels. The former Southampton left-back produced a pleasing display on the night. He defended and intercepted well but was even more effective in attack, creating several chances early on in the game. Shaw will be pleased he finally put in an impressive performance after having tough games in the Premier League. He looked convincing at the back and also in attack, finally showing why he cost United that much money. A solid, calm presence on a night where United could have given in to nerves when Brugge pressed high early on. His distribution from deep was as excellent as ever, but there was no major impact that he made in the game as he usually does with his dynamic movement and simple passing. He was not well into the game and he sat in front of the back four most of the time even when United were on the attack. 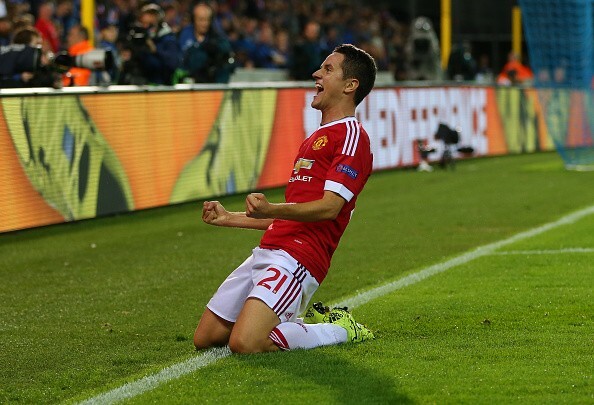 The Spanish midfielder looked impressive in the start he was given by manager Van Gaal. He created chance after chance as he linked up well with Mata, Rooney and Memphis. He was delighted after scoring United’s fourth goal and was substituted only moments after the goal. An early booking kickstarted a tough first-half for the returning midfielder. It didn’t get much better than when he fell over the ball in the box, but he recovered well in the second half, grabbing an assist and a goal. He kept United’s pressure on with his forward runs and wide range of passing, even though he was marked well by Brugge.